The tower and cabin are connected by a greenhouselike glass hyphen. In the 19th century, it was the Great Camps in the Adirondack Mountains of New York State that set the style for summer. Based principally on the architecture of Swiss chalets, these well-heeled twiggy treehouses, rustic yet refined, paid homage to the great outdoors as well as to the opulence of the era. In the living room, the original fieldstone fireplace dominates. Windows open out to the screened-in porch facing the lake. 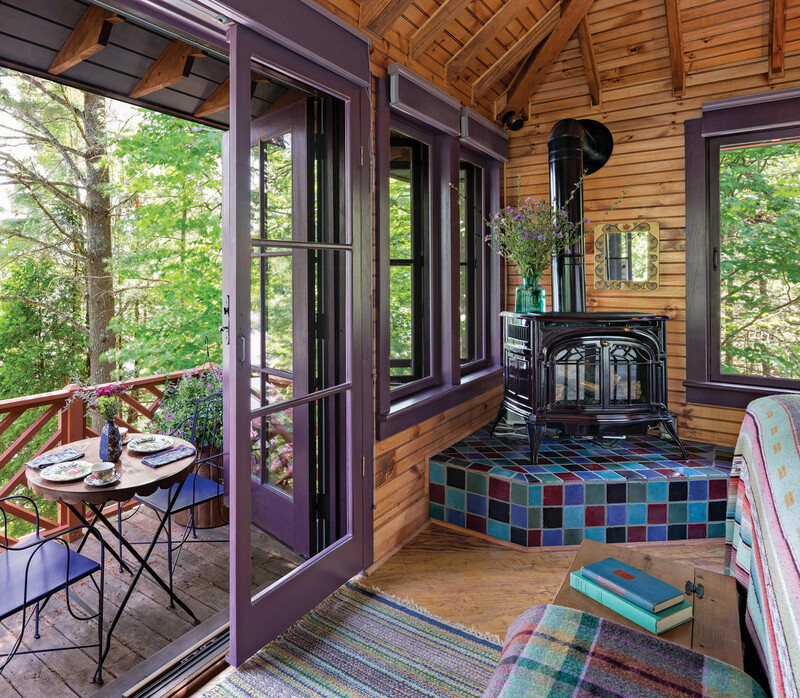 The Adirondacks style, which was advocated by radical Victorian tastemakers like Charles Eastlake, has never gone out of style. Indeed, so ubiquitous is it that it has become not only a synonym but also a cliché for the little log cabin in the woods. 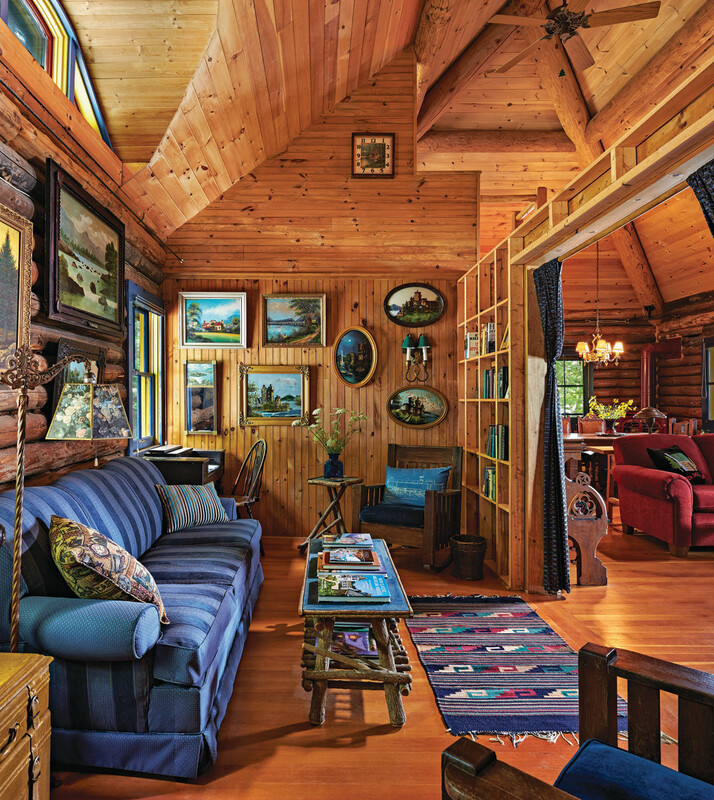 Sally Berk, a historical preservationist based in Washington, D.C., set out to break the branches of conventional Adirondacks style while still keeping it wonderfully—and whimsically—rooted in the past. 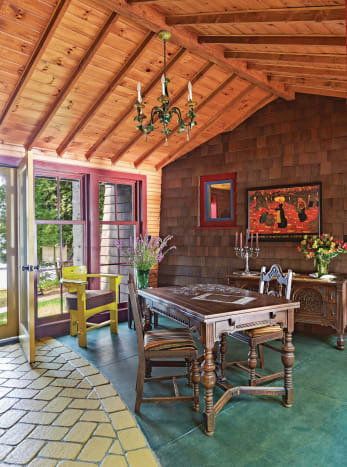 The lakeside summer cabin she and her husband, Sandy Berk, bought was so small that they named it No Vacancy. 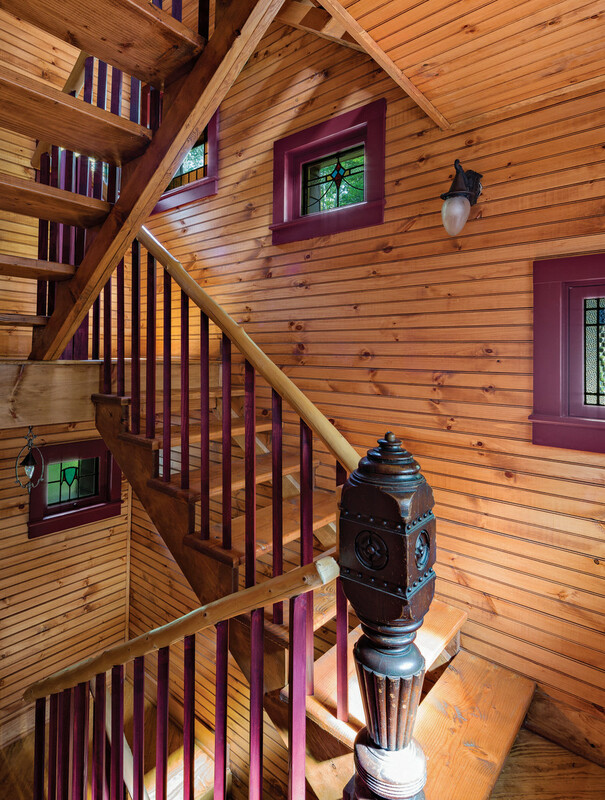 The antique newel post and stainedglass windows in the tower’s staircase are from Sally Berk’s collection. A fixer-upper, it was virtually uninhabitable. 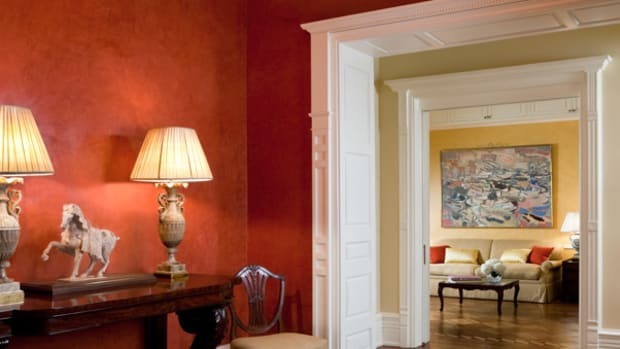 Several years after they renovated it with architect John Thompson of Washington, D.C., they decided to expand the space so their two children and two grandchildren could visit. Berk, Associate AIA, collaborated with Jacob D. Albert, AIA, and J.B. Clancy, AIA, of Boston-based Albert, Righter & Tittmann Architects or ART Architects, to give the twigs a contemporary twist. 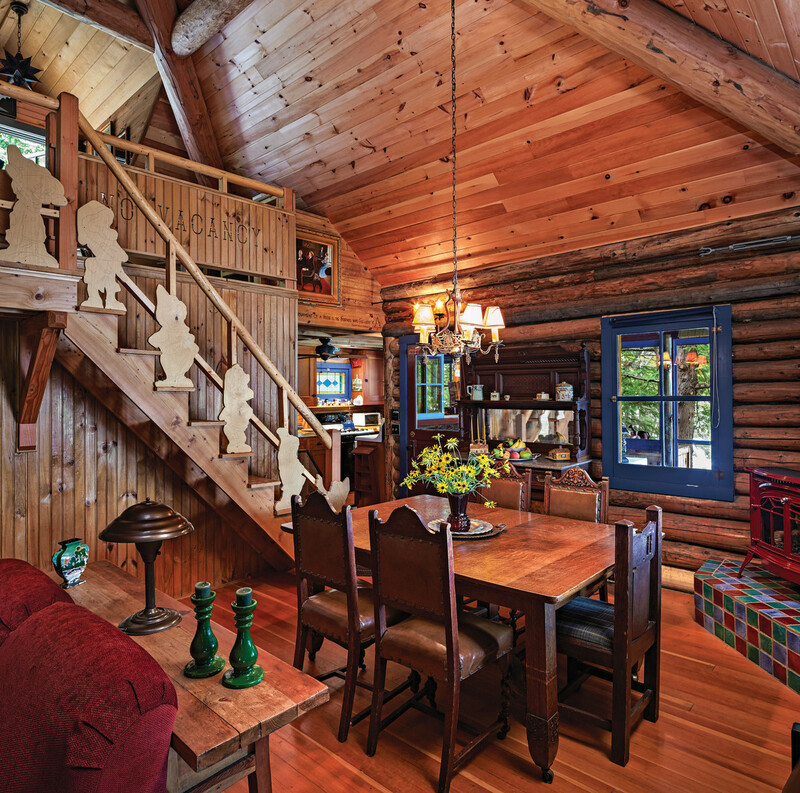 The cabin’s original and only bedroom was converted into a library whose book shelves are the studs of the wall. The property, which is positioned close to the lake, is set off a paved road not far from the highway. 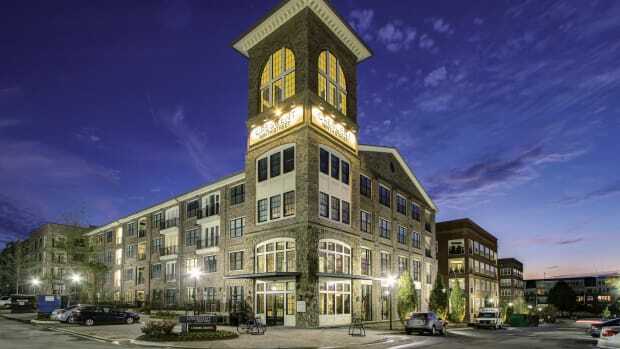 For her outdoors oasis, Berk envisioned a three-story tree-topping tower with a bedroom and bathroom on each floor and a separate color scheme to distinguish each. The siting of the tower was done after careful study of the surroundings. The small kitchen has a pass-through window so the cook can serve food to those on the screened-in porch. The countertops are slabs of pine, and the wooden cabinets are in a traditional 19th-century style. 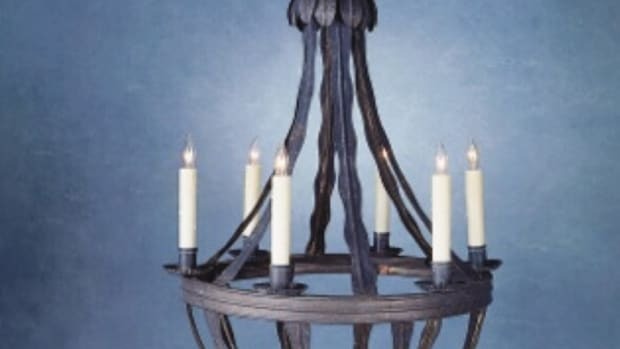 Berk also wanted to incorporate her collection of antique stained-glass windows and architectural elements and artifacts, which included a newel post and vintage bathroom fixtures, in the design. 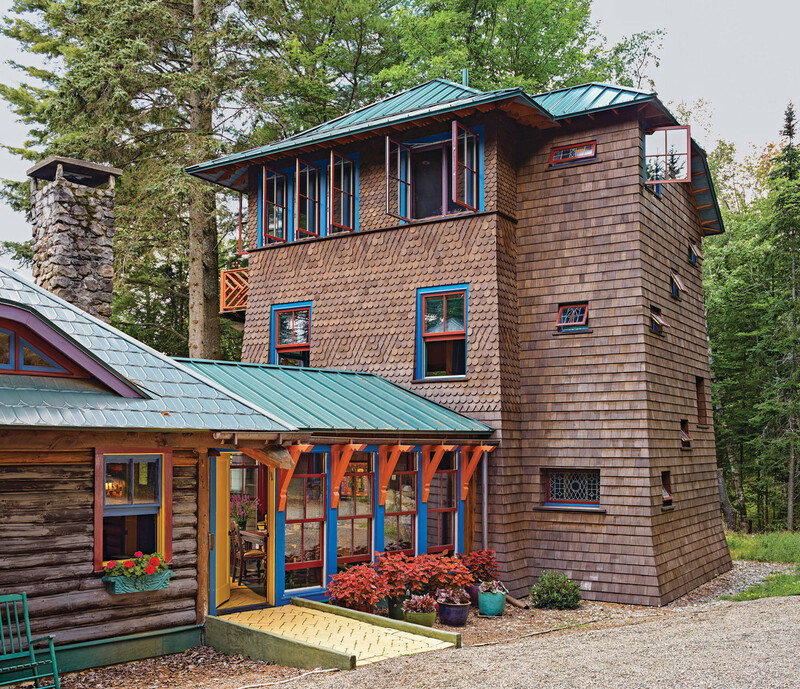 With its elaborately patterned fish-scale cedar shingles and bright colored brackets and window frames and sashes, the tower looks as though it could be a fairy-tale abode. A window seat creates a cozy corner in the master bedroom. 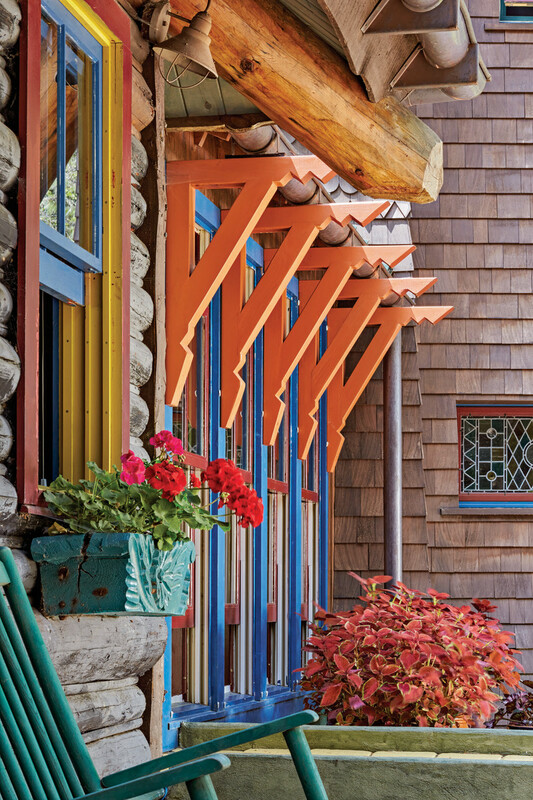 He mentions the dramatic wooden rafter tails on the roof, which look like flying lightning bolts thrown to Mother Earth by Zeus from Mount Olympus, and the red and blue primary-color scheme of the new windows. “There was no particular great challenge to the project,” he says. “Contractors, however, were scarce and came from fairly far away; some of them had to drive over an hour to get to the property. The Adirondacks have severe winters, so that slowed the building. ” No Vacancy’s architectural adventure starts at the yellow-brick road, which leads not to Oz but to a plain wooden front door of the same hue. Open it, and like Alice in Wonderland, you’re transported to another world. A balcony in the tower’s master suite brings the outdoors in, and an old-fashioned gas-fired stove provides heat on cool nights. Step off the yellow path to tour the cabin, where there’s a library whose books are shelved casually in the open studs of the wall. Before the renovation, it was the only bedroom. 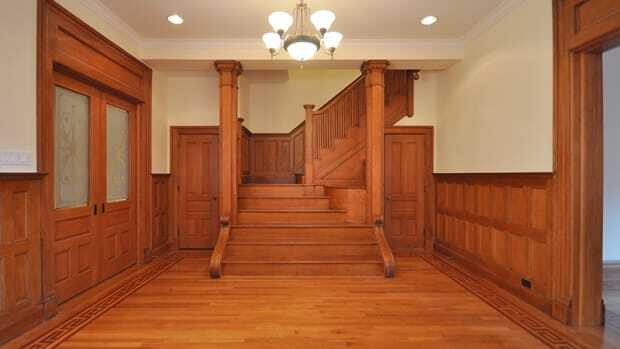 In the dining room, wooden cutouts of the Seven Dwarfs march up the stairs. They’re showing the way to the loft in the eyebrow gable where guests stay. 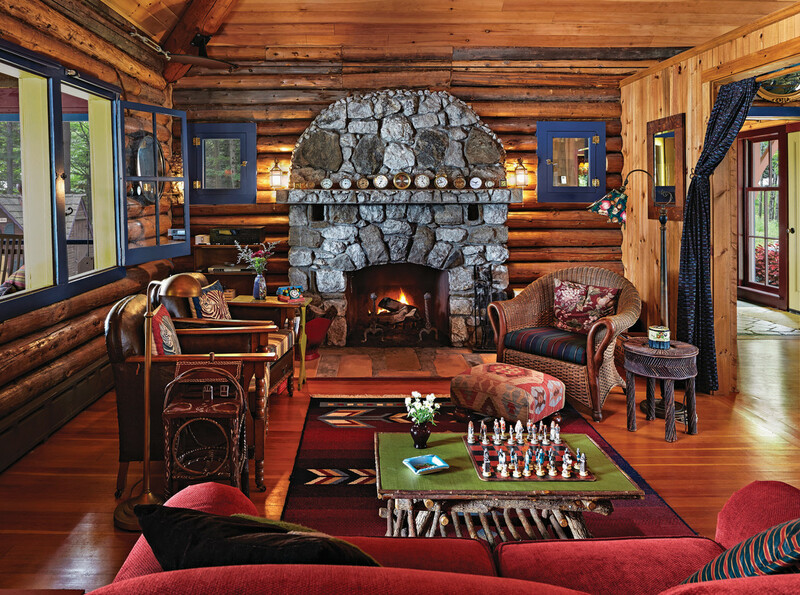 The living room is defined by the massive fieldstone fireplace, which was original to the cabin and has a matching semicircular stone overmantel that reaches nearly to the ceiling. 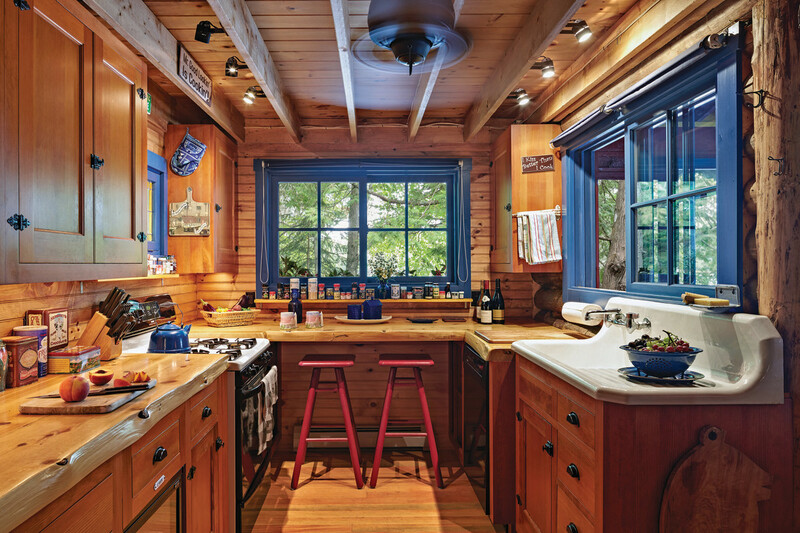 The kitchen, which features pine-slab countertops and a pass-through window to the screened-in lakeside porch, is big enough—almost—for two cooks as long as they don’t turn around. It’s also a space for a couple to sit and sup. The route to the tower is across the yellow-brick road and through the greenhouse-like connector, whose colorful floor-to-ceiling windows look at the lake. The tower’s first floor, also known as the red level, leads to the green level and finally the purple penthouse, where a balcony surveys the water and a coffee bar is fitted cleverly into the staircase. “Three floors is a long way to walk in the morning for a cup of coffee,” Albert says, adding that the Berks usually drink theirs on the balcony so they can admire the scenery. 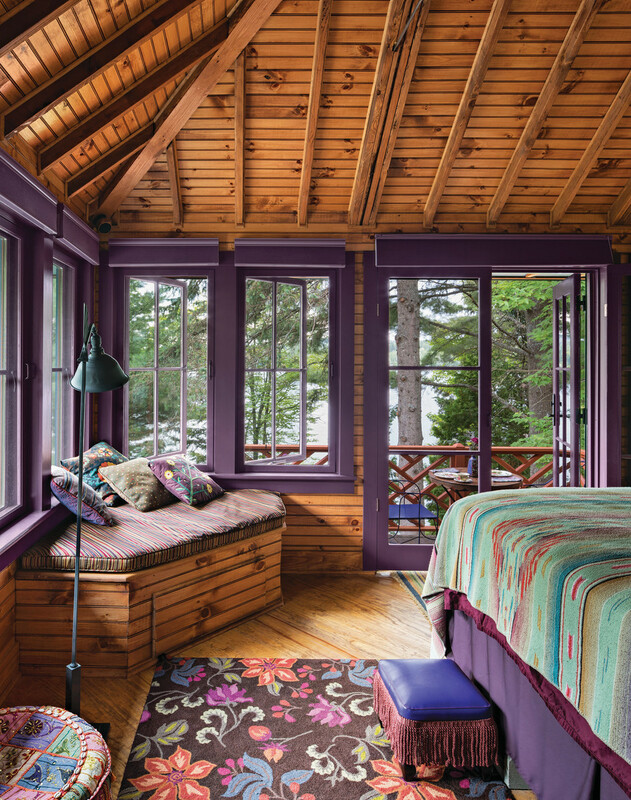 Each bedroom is heated by an old-fashioned-style gas-fired stove set atop a platform of multi-colored Arts and Crafts-style tiles. And each bathroom is appointed with vintage fixtures and Arts and Crafts-style tiles. The window brackets on the connector are defined by their traditional-inspired design and bright color. Each floor is decorated to suit its occupants. The grandchildren’s green level, for instance, is outfitted with new bunk beds. An electric train set that belonged to Sandy chugs in circles around the top of the room. The rooms, furnished by Berk, are a mix of antiques and new pieces. It was she, for instance, who designed the headboard in the master suite. 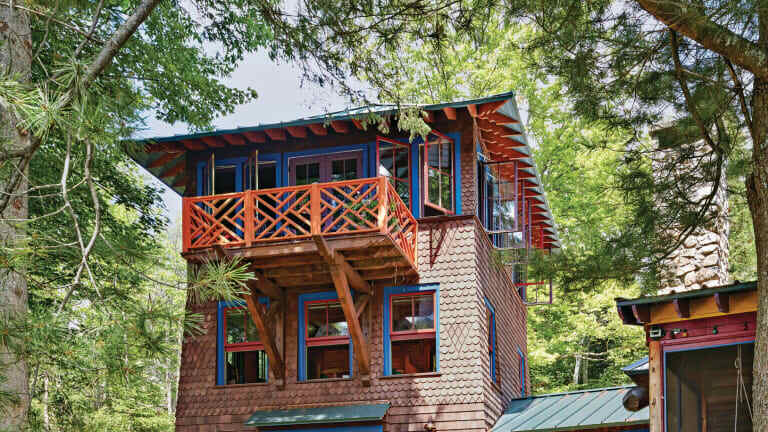 It’s made of twigs that are painted in the same colors as the windows and trim on the tower and cabin. The first room inside the connector is the entry, which serves as a secondary dining room and a games/entertainment space. Since the completion of the tower, No Vacancy has more than lived up to its name: It’s full all summer long.